People – especially Southerners, and especially Southerners in the ‘hood – have a tendency to exaggerate. 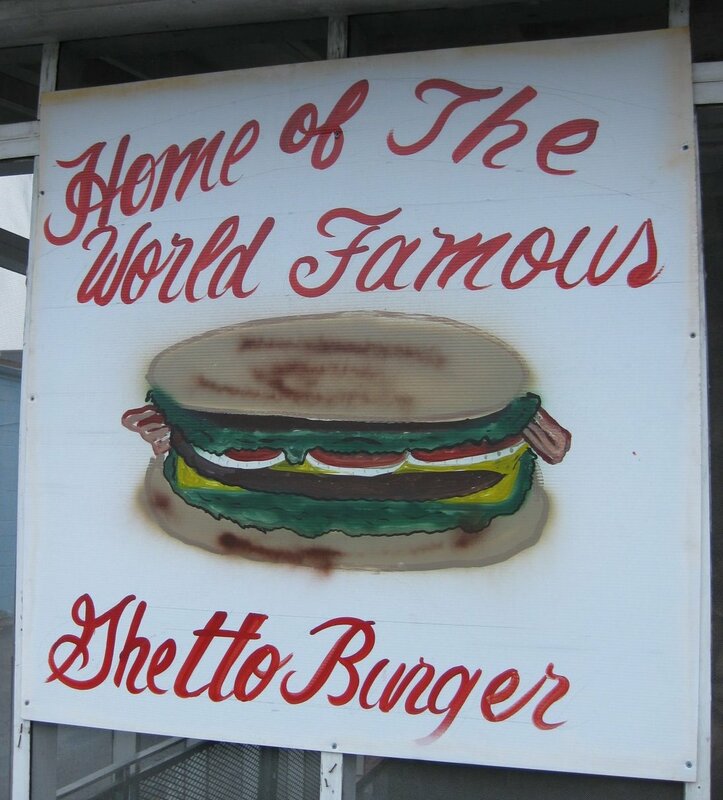 Exaggeration and braggadocio are simply part of the parlance of the South and especially of those well-known Southern ‘hoods like Kirkwood – home of Ms. Ann’s Snack bar and – as the red painted words on the side of the building will tell you – home of the “World famous ghetto burger”. 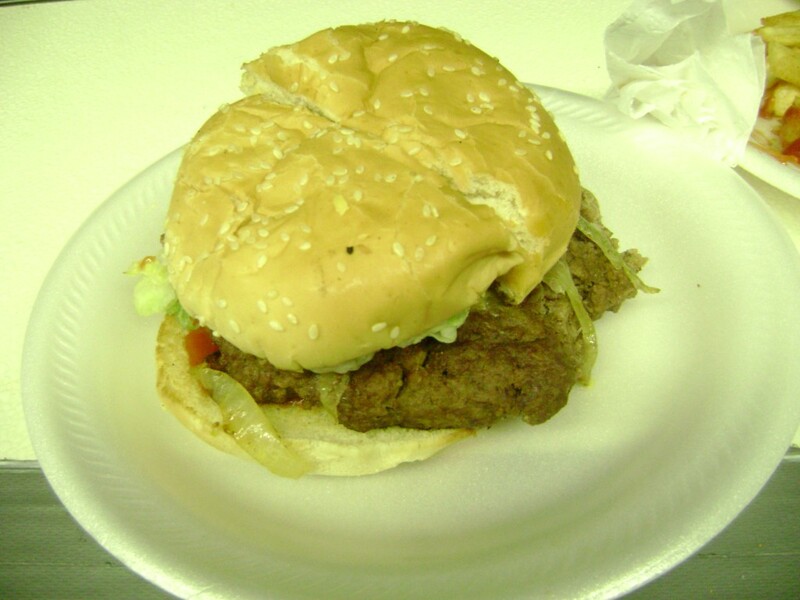 Now, I’m not certain if people in other countries have heard of Ms. Ann or her monstrously sized burgers, but due to a 2007 article in the WSJ, the ghetto burger received national acclaim as the nation’s # 1 burger. ‘Nationally Renowned Ghetto Burger’ doesn’t quite have the same snappy ring to it, plus the shack-sized snack bar probably doesn’t have enough room for all those extra letters, so… world-famous it is. Regardless, both the burger and the woman are famous enough in local circles to have become the stuff of legend, and since rumor has it that Ms. Ann will be hanging up her spatula for good this month (not the 1st time that rumor has surfaced, mind you), I felt it was my duty to pay her a visit before the legend became history. I approached the screen door of the snack bar with a feeling of trepidation. Ms. Ann’s reputation preceded her, and the image I’d painted of her in my head was somewhere between the Soup Nazi and the Great Oz. I’d heard of her long list of rules prominently posted above the counter, and had been repeatedly warned with tales of what happened to those who dared not follow them – a fate that could range from being yelled at to being thrown out. I couldn’t remember all of the rumored rules, but the ones I did remember seemed simple enough: no talking on cell phones, no cussing, no babies on the lunch counter, the standard no-shirt-no-shoes-no-service, and the most important of all: if there are no seats available at the 8-seat lunch counter, do not come inside. Unfortunately, when I arrived, the counter was full, but an elderly couple was preparing to leave, so I took a seat on the worn white patio furniture in the snack bar’s ‘waiting area’. On a previous attempted visit, both the counter and the waiting area were full, and the wait was up to 2 hours. Needless to say, I felt lucky to only have a few minutes pass before going inside. of gratitude scribbled in the corners of each. Behind the counter, I spied the legend herself, a cocoa-colored, wiry older woman who was moving rather nimbly between an impossibly small griddle loaded with impossibly large hamburger patties, and a dilapidated fridge stocked to the brim with burger toppings and large plastic jugs of tea, lemonade, and red punch. On the opposite wall of the restaurant was another framed picture, this one larger than the rest – a black-and-white graduation photograph of a young Ms. Ann… smiling. On one of her passes from griddle to fridge, Ms. Ann stopped to chat with a couple and their two young daughters that were seated next to me. During the exchange, the smile appeared again. I was beginning to wonder if I had stumbled into the wrong Ms. Ann’s Snack Bar. Maybe this was a Bizarro Ms. Ann that had no rules and treated customers with a smile instead of a snarl. Just then, she stepped over to take my order. A little more brusque than I would have expected anywhere else, but the tone was really to let me know that if I was going to be one of these indecisive or overly picky customers, she was not going to be the one to indulge me. It was just the reality check I needed to convince me that I was indeed in the right place. I’ve always been a fan of watching my food being cooked, it’s about as close as you can get to cooking something yourself, plus it’s an opportunity to see the skill and love that the person preparing your food puts into it. 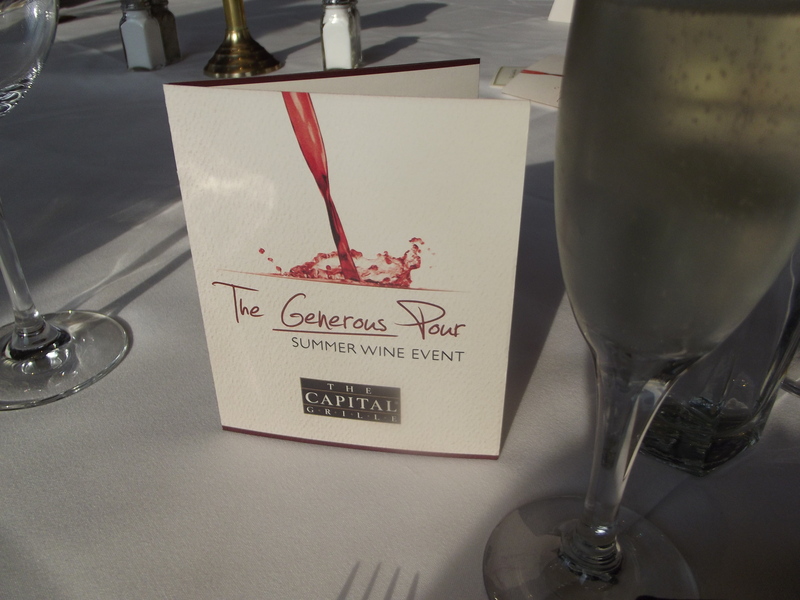 You get a greater sense of appreciation and connection to the end result than you do when your plate of food just magically arrives from somewhere in the back. Once you’ve seen Ms. Ann hand-shape those huge beef patties, slap them on the grill with all of the finesse of a mustachioed Swedish masseuse named Helga, then move back and forth in the narrow cooking space behind the counter with the automated assurance of someone who’s been doing this for decades, you will most certainly appreciate the end result when she sets it in front of you. My cheeseburger – topped with sautéed onions, lettuce, and tomato – almost completely filled one Styrofoam plate, while my order of fries – dusted with seasoned salt – filled another. 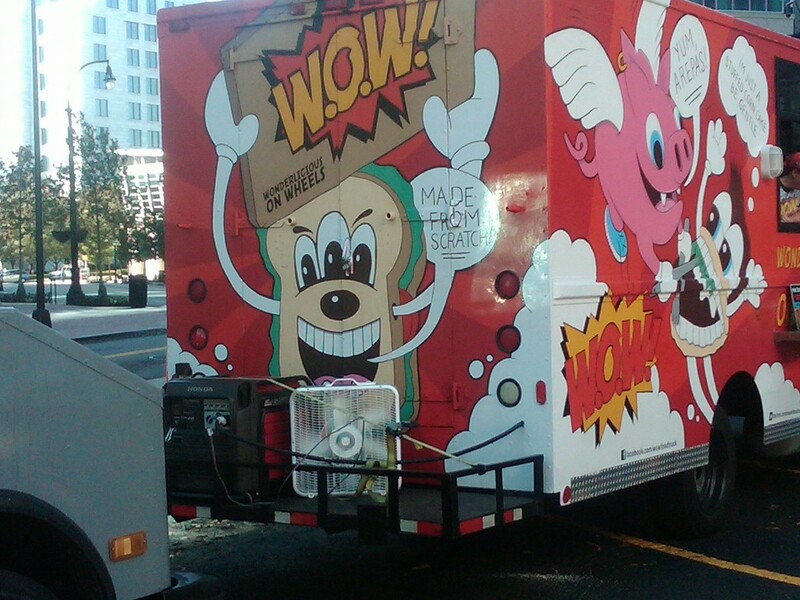 I took my first bite of the world-famous, nationally renowned burger, and found it to be… good. Was it the best burger I’d ever had? Was it, for that matter, better than something I could have made in my own kitchen? Not really. But it was good. Well seasoned, well done, topped with fresh ingredients, and so large that even with my most earnest attempt, I couldn’t possibly finish the whole thing. In Latin American, Caribbean, and Asian countries, street and neighborhood food vendors are a prominent feature of the dining-out landscape. The personalities of the proprietors are often as much of a draw as the food itself, and those that stay in the game for years usually become larger-than-life personas as a result of the local lore surrounding them. By contrast, the majority of the American dining public has abandoned neighborhood food stands in favor of a more anaesthetized, highly styled eating experience. 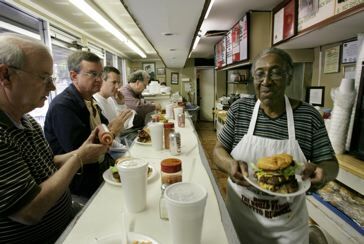 So the fact that Ms. Ann is still holding her own after 37+ years, and continues to draw crowds of locals and visitors alike, proves that she and her ghetto burger are most definitely legends. No exaggeration required.